The little holly stamp from the set makes a fabulous wreath. 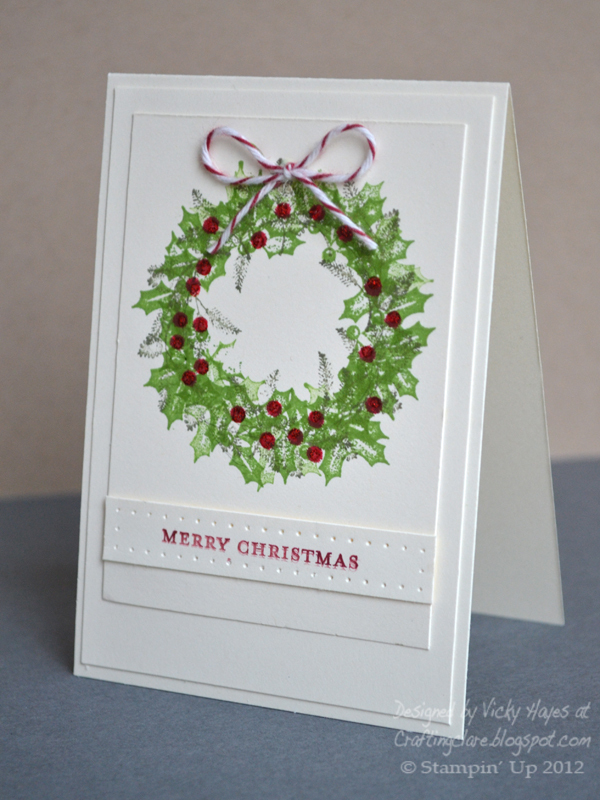 I stamped it in Gumball Green, added more greenery with the little fir sprig image from Lovely as a Tree and dotted on berries with a marker. The sentiment tag was given a bit of interest with piercing - one of my favourite embellishments at the moment. I gave the wreath a bakers twine bow and a touch of sparkle with Cherry Cobbler Dazzling Details - two fantastic ways to pep up a card and for less than a fiver for both, now that's what I call a bargain! I'd be delighted to order any of these items for you and have them delivered straight to your address in the UK. I'm committed to providing excellent customer service and am always happy to offer help and advice. To place your order, just send me an email or give me a call on +44 (0) 1280 820593. Check out current special offers here. I seem to have spent quite a lot of the weekend in the supermarket this weekend. While I was there I picked up the store magazine called 'Real Food' which my daughter came across while helping me unpack the bags. "Ah - Real Food!" she said. "None of this pretend food you've been fobbing us off with!" The cheek! I'll be back with some little boxes tomorrow - see you then! From Happy Hour??!! Really??!! Gorgeous!! Love the wreath Vicky, so traditional and beautifully stamped! What a beautiful wreath and so perfectly stamped the addition of the glitter is such a lovely festive touch.